Black Scholar-Librarians on Elizabeth McHenry’s Forgotten Readers: Recovering the Lost History of African American Literary Societies (Duke University Press, 2002). 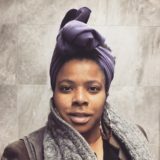 Olaronke Akinmowo is a Bed-Stuy born visual artist, cultural scholar, yoga teacher, set decorator, and mom. She creates interactive installations, performances, altars, paper works, and collages that center and celebrate Black womanhood. Her art practice is based in an inquiry and an exploration of the deep and beautiful connections between race, culture, and gender. In 2015 she started The Free Black Women’s Library, an interactive roving biblio-installation that holds a collection of 900 books written by Black women. This mobile library travels throughout New York City and pops up monthly in a wide range of public locations and cultural institutions. This social art project also features performances, workshops, readings, film screenings, and critical conversations. Olaronke is working on expanding the library to create a digital app and is also raising money to purchase or build a tiny home or bus that will serve as a physical container/bookmobile for the mobile library which she can then take across the country. Find out more about the library through your favorite social media platform, IG, Tumblr, Facebook or Twitter. Adjua Gargi Nzinga Greaves (NYC, 1980) is an artist concerned with postcolonial ethnobotany, the limits of language, and archive as medium. Greaves has most recently been published in the collections Letters to the Future: Black Women / Radical Writing (Kore Press, 2018), and Creature/Verdure (Pinsapo, 2018), as well as in her chapbook Close Reading As Forestry (Belladonna, 2017). Lyric Hunter is a writer from New York City. Her chapbooks include Motherwort (Guillotine, 2017) and Swallower (Ugly Duckling Presse, 2014). Her work has also appeared in Pelt Vol. 4: Feminist Temporalities, The Felt, Poems by Sunday, Belleville Park Pages, and Arava Review. Jhani Miller is an award winning scholar hailing from the University of Illinois School of Information Science. Her work relates to black femme identity, emotional health, and social influence. When she isn’t advocating for historically marginalized groups in libraries, she’s an aerial performer, lo-fi photographer, and geek culture researcher. You can find her at the Brooklyn Public Library where she is the Library Information Supervisor or reach out to her online on Instagram at Librarian_shimmy.